SUPERIOR PCS & ELECTRONICS All computer services for home or office. Most electronic, game console repairs. Networking, Security and Tu- toring services. Call for day or evening ap- pointments for your conve- nience. 401-949-2777 $$$$ ALWAYS BUY− ING ANTIQUES OLD TOYS TOOLS VINTAGE ITEMS & MORE $$$$ BUYING ANTIQUES, OLD TOYS, GI JOE, BARBIE, DOLLS, METAL CARS, 1980S TOYS, OLD TOOLS, WOOD- WORKING, MACHINIST, OLD KEYS, DOORKNOBS, LIGHT- ING, RADIOS, STRAIGHT RA- ZORS, OLD FISHING, ADVER- TISING SIGNS, GAS STA- TION, BARBER ITEMS, BEER SIGNS TRAYS, MILITARY, PAINTINGS, AND MORE, YOUR OLD ITEMS HANGING AROUND COULD TURN INTO $$$$$$$$$ 401-636-1391 WANTED: OLD costume jewelry, cash paid on the spot. 401-351-0128. 8-WEEK SHORKIE Puppies; 4 girls, 1 male. $650. Shots & Vet health certificate. 401-304-6521 3 BEDROOM HOUSE 1 bath (updated), new stainless appliances, washer & dryer, garage, nice yard. No dogs. Johnston/Scituate line. $1800/Month. Available now. (401) 837-4493 EAST WOONSOCKET: Ideal for 1 person, 1st fl., 1 bed, w/d, cable, carport. Heat inc. $680/mo. plus security. 401- 766-9495. LINCOLN: Newly painted w/3-season rm, on-site parking, No utilites Non-smoking, no pets. $1,100.00 plus security. Garage available $100/mth. (401) 663-2550 BLACKSTONE: 4 Rooms, 2 beds, 1st fl. applianced, off- street parking. 1st, last, sec. $865/mo. Call 508-962- 3632. 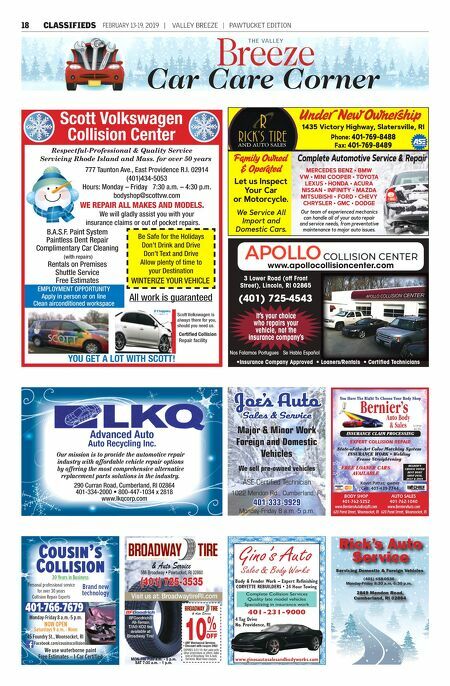 Breeze Classifieds Deadline The deadline for placing classified ads in The Valley Breeze by phone is Tuesday, by 12 noon. Ads may be placed at 334-9555, Ext. 132 or 134, online by 11 a.m. at valleybreeze.adperfect. com or by mail to The Valley Breeze, 6 Blackstone Valley Place, Suite 204, Lincoln, RI 02865. ESMOND: 2 bedroom, 2nd fl. Applianced. W/D hook- ups, gas heat. Yard, parking. No smoking/pets. $775/mo. 401-353-1017 STORE OR OFFICE, Centredale. 500/sq.ft. 1967 Smith St. High traffic area. $500/mo. 401-258-0679. OPEN HOUSE $25 SPECIAL: Do you have an open house coming up? Take advantage of our special offer! 1 Week, 4 lines of text, with a color photo in print. Deadline is Tuesday at 11 a.m. for that Thursday's paper. Must be placed online at valleybreeze.com . New England Classifieds A PLACE FOR MOM. The nation's largest senior living referral service. Contact our trusted, local experts today! Our service is FREE/ no obligation. CALL 1-855- 799-4127. DEALING WITH WATER DAMAGE requires immediate action. Local professionals that respond immediately. Nationwide and 24/7. No Mold Calls. 1-800- 506-3367 DO YOU HAVE CHRONIC KNEE OR BACK PAIN? If you have insurance, you may qualify for the perfect brace at little to no cost. Get yours today! Call 1-800-217-0504 INVENTORS-FREE INFORMATION PACKAGE Have your product idea developed affordably by the Research & Development pros and presented to manufacturers. Call 1-855-380-5976 for a Free Idea Starter Guide. Submit your idea for a free consultation. LIFE ALERT. 24/7. One press of a button sends help FAST! Medical, Fire, Burglar. Even if you can't reach a phone! FREE brochure. CALL 800- 457-1917 LUNG CANCER? 60 or Older? If so, you and your family may be entitled to a significant cash award. Call 800-364-0517 to learn more. No risk. No money out of pocket. MOBILEHELP, AMERICA'S PREMIER MOBILE MEDICAL ALERT SYSTEM. Whether you're Home or Away. For Safety and Peace of Mind. No Long Term Contracts! Free Brochure! Call Today! 1-844-892-1017 OXYGEN-ANYTIME. Anywhere. No tanks to refill. No deliveries. Only 2.8 pounds! FAA approved! FREE info kit: Call 1-800- 732-0442 SPECTRUM TRIPLE PLAY TV, Internet & Voice for $29.99/ea. 60 MB per second speed. No contract or commitment. We buy your existing contract up to $500.! 1-844-592-9018 STAY IN YOUR HOME LONGER with an American Standard Walk-In Bathtub. Receive up to $1,500 off, including a free toilet, and a Lifetime warranty on the tub and installation! Call us at 1-866-945-3783. STOP STRUGGLING ON THE STAIRS. Give your life a lift with an ACORN STAIRLIFT! Call now for $250. OFF your stairlift purchase and FREE DVD & brochure! 1-844- 286-0854 UNABLE TO WORK DUE TO INJURY OR ILLNESS? Call Bill Gordon & Assoc., Social Security Disability Attorneys! FREE Evaluation. Local Attorneys Nationwide 1-800-586-7449. Mail: 2420 N. St. NW, Washington DC. Office: Broward Co. FL (TX/ NM Bar) WARM WEATHER Is Year Round In Aruba. The water is safe, and the dining is fantastic. Walk out to the beach. 3-Bedroom weeks available. Sleeps 8. Email: carolaction@aol.com for more information. Nationwide Classifieds 70 YEARS old, kids are grown. Still need your life insurance? Or is a big LIFE SETTLEMENT CASH PAYOUT smarter? Call Benefit Advance. 1-866-719- 5766. ADVERTISE TO 10 Million Homes across the USA! Place your ad in over 140 community newspapers, with circulation totaling over 10 million homes. Contact Independent Free Papers of America IFPA at danielleburnett-ifpa@ live.com or visit our website cadnetads.com for more information AIRLINE MECHANIC TRAINING - Get FAA Technician certification. Approved for military benefits. Financial Aid if qualified. Job placement assistance. Call Aviation Institute of Maintenance 866-453-6204 AT&T INTERNET: Get More For Your High-Speed Internet Thing. Starting at $40/month w/12-mo agmt. Includes 1 TB of data per month. Ask us how to bundle and SAVE! Geo & svc restrictions apply. Call us today 1-833-707-0984 CABLE-INTERNET-PHONE No Credit Check! No Contracts! $29.99 each! Bundle - Save huge! We're local installers! Call Free Quote! 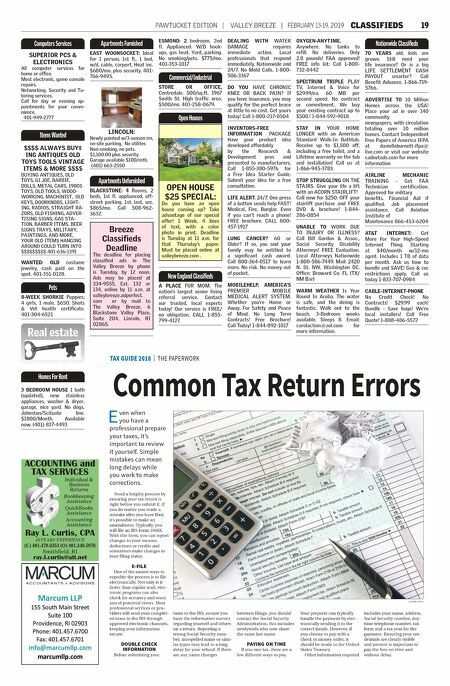 1-888-486-5572 PAWTUCKET EDITION | VALLEY BREEZE | FEBRUARY 13-19, 2019 CLASSIFIEDS 19 ACCOUNTING and TAX SERVICES Individual & Business Returns Bookkeeping Assistance QuickBooks Assistance Accounting Assistance Ray L. Curtis, CPA 45 YEARS EXPERIENCE (C) 401.479.6353 (O) 401.349.5976 Smithfield, RI ray.l.curtis@att.net TAX GUIDE 2018 | THE PAPERWORK Avoid a lengthy process by ensuring your tax return is right before you submit it. If you do realize you made a mistake after you have filed, it's possible to make an amendment. Typically, you will file an IRS Form 1040X. With this form, you can report changes to your income, deductions or credits and sometimes make changes to your filing status. E-FILE One of the easiest ways to expedite the process is to file electronically. Not only is it faster than regular mail, elec- tronic programs can also check for accuracy and warn you of potential errors. Most professional services or pro- viders will send your complet- ed taxes to the IRS through approved electronic channels, keeping your information secure. DOUBLE CHECK INFORMATION Before submitting your taxes to the IRS, ensure you have the information correct regarding yourself and others on a return. Reporting a wrong Social Security num- ber, misspelled name or simi- lar typos may lead to a long delay for your refund. If there are any name changes between filings, you should contact the Social Security Administration, this includes newlyweds who now share the same last name. PAYING ON TIME If you owe tax, there are a few different ways to pay. Your preparer can typically handle the payment by elec- tronically sending it to the correct hands. However, if you choose to pay with a check or money order, it should be made to the United States Treasury. Other information required includes your name, address, Social Security number, day- time telephone number, tax form and a tax year for the payment. Ensuring your cre- dentials are clearly visible and present is important to pay the fees on time and without delay. © ADOBE STOCK Common Tax Return Errors E ven when you have a professional prepare your taxes, it's important to review it yourself. Simple mistakes can mean long delays while you work to make corrections.